Since late 2012 I've been working on a film for my brother, it started off as his final project for his Masters degree and ended up being a bit of a passion project for myself. We completed principal photography in January 2013 (after running over a little bit) and Michael got on with the post production which he did on his own. He was a little rushed for time and handed in what he could do in the time he had, the film was good but was essentially a first assembly with some tweaks and effects added to it; it was still well received when screened though. I offered to finish the film for Michael as I wanted it to be truly finished and Michael didn't have the time to complete it how he wanted. I was initially the DoP so knew the footage well, and knew where there would be fixes to make; also having a third party look at your edit can be very beneficial as the director can sometimes not see where cuts could be made to better the project. I ended up cutting out around four minutes from what was originally an 18 minute film, and when I showed it to Michael he was unsure what I'd cut, which was essentially a lot of traveling and coverage we had to make sure we had room to play later. After we were happy with the edit I started work on the grade, which was my first grading project using Magic Bullet Looks. I'd purchased it to better my grading as I find the tools inside Premiere good but limiting, Magic Bullet allows you to change the exposure in certain areas of a frame and has better colour controls. One big downside to Magic Bullet, is that it is NOT a standalone programme, but in fact a plugin that works inside premiere,; it essentially sits on your clip like a single filter and you need to open that each time you want to make adjustments. It can be slow and doesn't allow you to check continuity between clips easily without closing the plugin first. Also the plugin only selects a frame from your playhead position to give you a reference when grading, it's not a playable video clip; and on a slow iMac like mine, playback is out of the question on un-rendered video that's been altered by third party software. 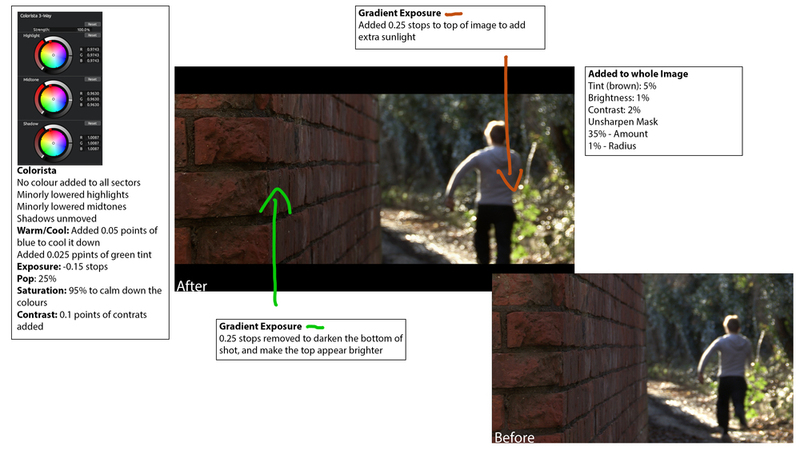 I'm writing this up as I took a few grabs from the film to show Michael's college class how I altered each image to show them how you can alter images in grade to affect the mood and style of a scene. Obviously there are better people in the world at this, who do far more to their images than I have, but these are grabs from an XF305, on a low budget short, graded with consumer priced software, which does have limitations but is ultimately amazing for the price. You can download the grabs here but you can also see them below, with their annotations to explain what I did and why, these are 4K resolution images so that 1080 video image sits in the middle with plenty of space for me to annotate. As always, I hope you find these useful and any comments are welcome.